Advanced Marketing is the full Marketing module integrated with your Really Simple Systems CRM. It includes all the available features of Email Marketing, Campaign Management, Drip Marketing, DribbleMail, Web Forms and Web Transactions. It allows you to run, control and report on all your marketing campaigns, send up to 50,000 bulk emails or newsletters per month, and track the results right through to your sales. The Marketing module includes features to enable compliance with the EU’s General Data Protection Regulation (GDPR). Advanced Marketing is available as an optional module with your CRM. See price plans. To add Advanced Marketing to your CRM go to Settings then Manage Subscription and select Change Plan & Options. 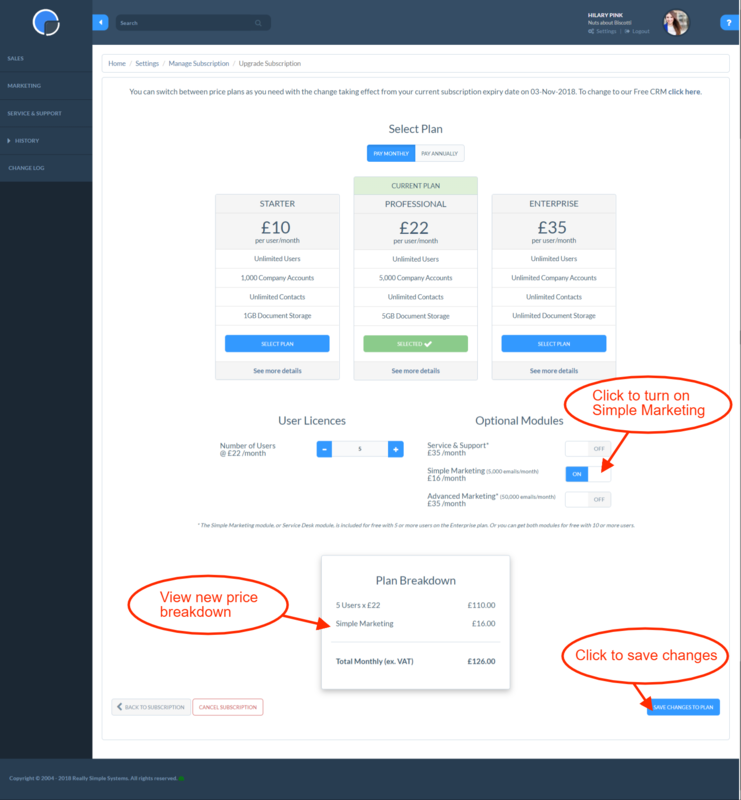 Use the toggle button to switch on Advanced Marketing, review your plan price changes, then Save Changes. Simple Marketing is a limited version of the Really Simple Systems module. The Simple Marketing function is aimed at small businesses, sending a low number of emails per month. This simple email marketing feature is available as an optional module with your CRM. It offers email marketing with a limit of 5,000 emails per month. You can create and send bulk emails or newsletters directly from your CRM system, without the additional features of Advanced Marketing. Please note, Simple Marketing is still undergoing development and is currently a cut-down version of Advanced Marketing, available at a reduced cost. To add Simple Marketing, in your CRM go to Settings then Manage Subscription and select Change Plan & Options. 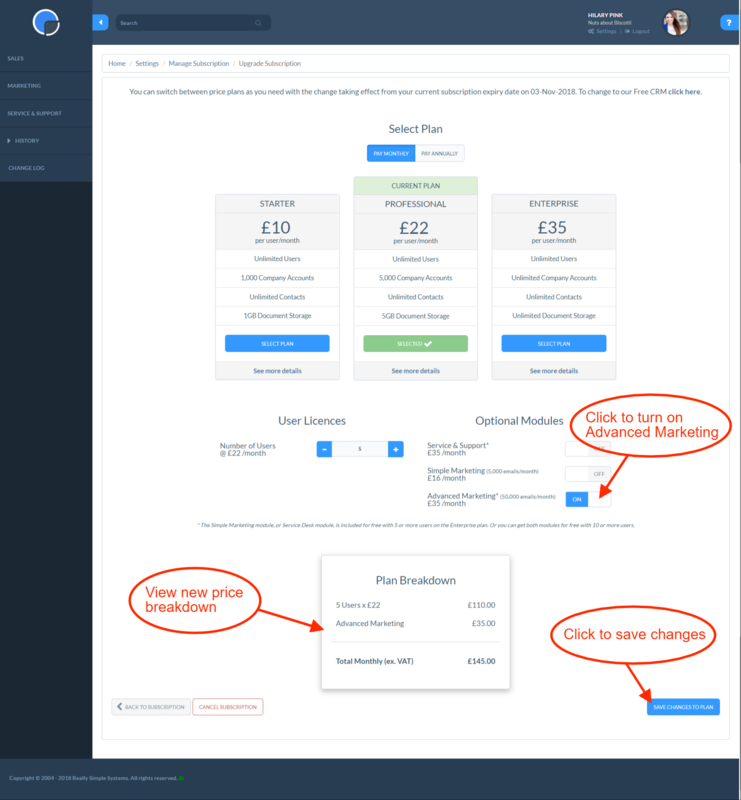 Use the toggle button to switch on Simple Marketing, review your plan price changes, then Save Changes.